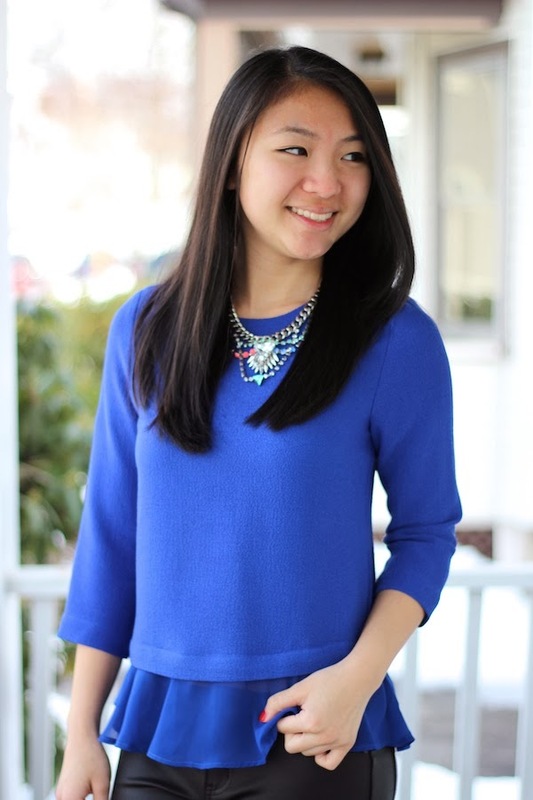 Cobalt blue is always the perfect color to break up a monochrome winter wardrobe. I love how the added chiffon creates an imitation peplum detail. It makes for an interesting combination of textures in an otherwise simple top. 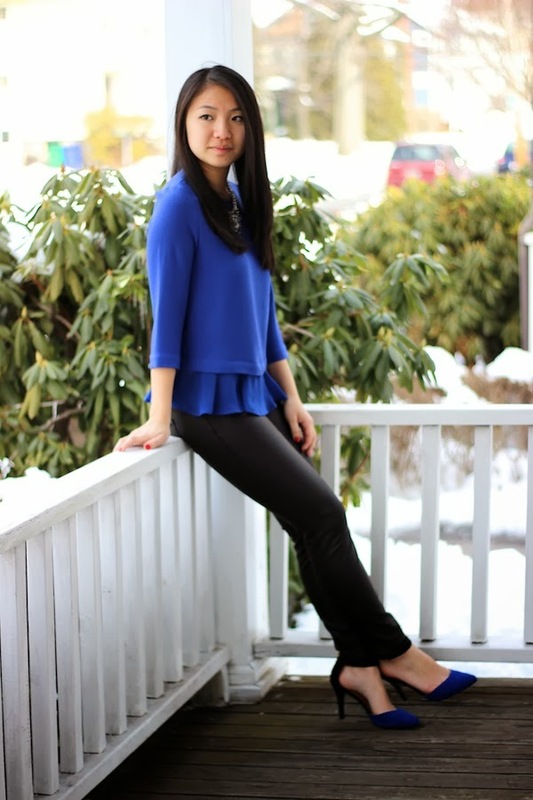 I chose this top from last month's Zara sale because it serves as an easy transition piece from winter to spring. The boxy silhouette makes for a sense of lightness that is perfect for the (slowly) rising temperatures. Coincidentally, I found these matching heels at Target around the same time. Despite the recent security issues, my faith in the company hasn't faded. There are always hidden gems throughout the store that I cannot resist (just use PayPal or cash!). These heels are very comfortable, especially for those who need some cute pairs for work. The heel itself isn't so high that you'll be aching by the end of the day. As much I love a sky-high pair of pumps, I need my collection of more practical heels for every day use. Thanks for stopping by! Let me know in the comments how you're transitioning between winter and spring. Talk to you soon! I'm a sucker for royal blues! I agree about having practical heels, what a great Target find! Cobalt blue is definitely one of my favourite colours at the moment! Same with a bright red :)! Also like how you've tied it in with your shoes too - Nice outfit! Mine as well! I will definitely have to find some cute red pieces for spring. Thanks for the comment! Thanks so much! I always find the most randomly cute thing at Target! blue looks very great with you..
and love your heels most! Thanks so much! Cobalt blue is always a fun color. The top is amazing! 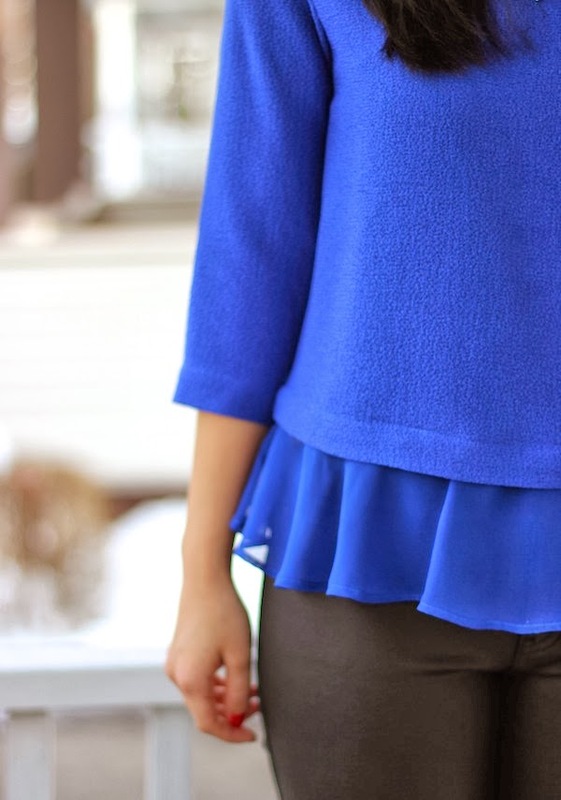 Love the peplum design and the royal blue! Same here haha it's such a great color for any season! I know right?! Target always has such lovely hidden gems. I definitely need to add more color to my winter wardrobe as well. Thanks for the comment!! I love that shade of.blue! Looking really pretty...and i'm loving the shoes! I don't transition from seasons to seasons though.... where i live, it's summer all year long :) ...the perks of living in the caribbean! Thanks so much! I'm jealous that you live in the Caribbean. I would love the have a longer summer!